Cranial sutures separate the skull bones and house stem cells for bone growth and repair. In Saethre-Chotzen syndrome, mutations in TCF12 or TWIST1 ablate a specific suture, the coronal. This suture forms at a neural-crest/mesoderm interface in mammals and a mesoderm/mesoderm interface in zebrafish. Despite this difference, we show that combinatorial loss of TCF12 and TWIST1 homologs in zebrafish also results in specific loss of the coronal suture. Sequential bone staining reveals an initial, directional acceleration of bone production in the mutant skull, with subsequent localized stalling of bone growth prefiguring coronal suture loss. Mouse genetics further reveal requirements for Twist1 and Tcf12 in both the frontal and parietal bones for suture patency, and to maintain putative progenitors in the coronal region. These findings reveal conservation of coronal suture formation despite evolutionary shifts in embryonic origins, and suggest that the coronal suture might be especially susceptible to imbalances in progenitor maintenance and osteoblast differentiation. Some of the most common birth defects involve improper development of the head and face. One such birth defect is called craniosynostosis. Normally, an infant’s skull bones are not fully fused together. Instead, they are held together by soft tissue that allows the baby’s skull to more easily pass through the birth canal. This tissue also houses specialized cells called stem cells that allow the brain and skull to grow with the child. But in craniosynostosis these stem cells behave abnormally, which fuses the skull bones together and prevents the skull and brain from growing properly during childhood. One form of craniosynostosis called Saethre-Chotzen syndrome is caused by mutations in one of two genes that ensure the proper separation of two bones in the roof of the skull. Mice with mutations in the mouse versions of these genes develop the same problem and are used to study this condition. Mouse studies have looked mostly at what happens after birth. Studies looking at what happens in embryos with these mutations could help scientists learn more. One way to do so would be to genetically engineer zebrafish with the equivalent mutations. This is because zebrafish embryos are transparent and grow outside their mother’s body, making it easier for scientists to watch them develop. Now, Teng et al. have grown zebrafish with mutations in the zebrafish versions of the genes that cause Saethre-Chotzen syndrome. In the experiments, imaging tools were used to observe the live fish as they developed. This showed that the stem cells in their skulls become abnormal much earlier than previous studies had suggested. Teng et al. also showed that similar stem cells are responsible for growth of the skull in zebrafish and mice. Babies with craniosynostosis often need multiple, risky surgeries to separate their skull bones and allow their brain and head to grow. Unfortunately, these bones often fuse again because they have abnormal stem cells. Teng et al. provide new information on what goes wrong in these stem cells. Hopefully, this new information will help scientists to one day correct the defective stem cells in babies with craniosynostosis, thus reducing the number of surgeries needed to correct the problem. Craniofacial anomalies are among the most common congenital defects, encompassing cleft lip and palate, facial malformations, and abnormalities in the flat bones forming the top of the skull. Craniosynostosis involves the premature fusion of the skull bones at sutures, fibrous structures that join the bones. During normal development, cranial sutures hold bones of the skull in place while providing malleability required during childbirth. Cranial sutures also contain stem cells that allow for continued skull bone growth as the brain and head structure expands (Zhao et al., 2015). While human skull bones eventually fuse later in life, precocious bone fusion in craniosynostosis correlates with region-specific defects in bone growth that often negatively impact growth of the underlying brain. Genetic causes of craniosynostosis include mutations in genes that participate in developmental signaling pathways, including FGFRs 1, 2, and 3 (Hajihosseini, 2008), TGFBRs 1 and 2 (Loeys et al., 2005), and the Notch ligand JAGGED1 (Kamath et al., 2002). A central unanswered question is the extent to which defects in these pathways result in a failure to maintain postnatal stem cells once the sutures have formed, or whether these pathways have roles in the specification and maintenance of bone progenitors during earlier phases of bone growth preceding suture formation (Flaherty et al., 2016). Most studies have focused on the maintenance of postnatal sutural stem cells, as these stem cells have only been recently marked with a variety of reporters in mice, for example based on Gli1 (Zhao et al., 2015), Axin2 (Maruyama et al., 2016), and Prrx1 (Wilk et al., 2017). Less is known, however, about how potential defects in the embryonic progenitors that grow the skull bones may prefigure suture loss, although a few reports describe altered bone formation during embryonic stages in craniosynostosis mutants (Merrill et al., 2006). The ex utero development and transparency of zebrafish provide a unique opportunity to track the progenitors that form the skull bones, and to better understand how defects in the dynamics of bone growth relate to a later ability to form and maintain sutures once the bones come together (Quarto and Longaker, 2005; Laue et al., 2011; Kague et al., 2016; Topczewska et al., 2016). A striking feature of many forms of craniosynostosis is that only particular sutures are affected. For example, in Saethre-Chotzen syndrome, the second most common form of craniosynostosis, the coronal suture is selectively lost. The majority of Saethre-Chotzen patients harbor heterozygous loss-of-function mutations in TWIST1 or TCF12, which encode basic helix-loop-helix transcription factors (el Ghouzzi et al., 1997; Howard et al., 1997; Sharma et al., 2013). Similarly, mice lacking one copy of Twist1, or compound heterozygous for Twist1 and Tcf12, display loss of just the coronal suture (Sharma et al., 2013). Analysis of mouse models has led to an appreciation of proper cell migration (Yoshida et al., 2008; Ting et al., 2009; Roybal et al., 2010; Deckelbaum et al., 2012), segregation of osteogenic and non-osteogenic cells at the sutural boundary (Merrill et al., 2006; Ting et al., 2009; Yen et al., 2010), and maintenance of postnatal stem cells (Zhao et al., 2015) in suture patency. However, it remains unknown the extent to which defects in early progenitors versus postnatal stem cells account for suture loss. As fish are amenable to repeated live imaging of calvarial bone growth and suture development outside the mother, this model provides an opportunity to correlate early defects in osteoprogenitors and bone growth with later suture loss in individual mutants, particularly in cases where the synostosis phenotype is variably penetrant. However, a potential complication is that the coronal suture of zebrafish (Kague et al., 2012; Mongera et al., 2013), as well as those of some amphibians (Piekarski et al., 2014) and birds (Matsuoka et al., 2005), forms at a mesoderm/mesoderm boundary, contrasting with the mammalian coronal suture that forms at a unique interface between the neural-crest-derived frontal bone and the mesoderm-derived parietal bone (Ishii et al., 2015) (Figure 1A). Mammalian sutures may therefore not be considered evolutionarily homologous to the sutures of these other vertebrates, at least from a strict embryological perspective. Should the neural-crest/mesoderm boundary be a factor in coronal sensitivity, non-mammalian coronal sutures might not be susceptible to the same genetic perturbations that cause coronal-specific synostosis in mammals. Coronal suture loss in tcf12; twist1b mutant zebrafish. (A) Diagrams of zebrafish, mouse, and human skulls, with neural crest contributions in turquoise and mesoderm contributions in gold. The coronal suture is at a mesoderm-mesoderm boundary in zebrafish and a neural-crest-mesoderm boundary in mouse and human. Instead of a suture, an epiphyseal bar cartilage (eb) is present at the neural-crest-mesoderm boundary in zebrafish. ms, metopic suture; ss, sagittal suture. (B) Dissected skullcaps of adult fish stained with Alizarin Red show loss of the coronal suture (asterisks) in tcf12-/-; twist1b-/- double mutants but not single mutants. Scale bar, 1 mm. (C) Micro-CT scans of adult fish heads show unilateral (left) and bilateral (right) coronal suture loss in tcf12-/-; twist1b-/- mutants. Shading indicates bone derived from neural crest (turquoise) and mesoderm (gold). Panels below are digital sections through the coronal sutures indicated by the dotted lines above. Arrowhead indicates the wild-type suture. (D) Hematoxylin and eosin-stained sections show loss of the coronal suture mesenchyme (arrowhead) in tcf12-/-; twist1b-/- mutants. Scale bar, 100 µm. We report in this study the generation of a zebrafish model of Saethre-Chotzen syndrome that faithfully recapitulates the craniosynostosis phenotype seen in mice and humans with heterozygous mutations in TCF12 and TWIST1. 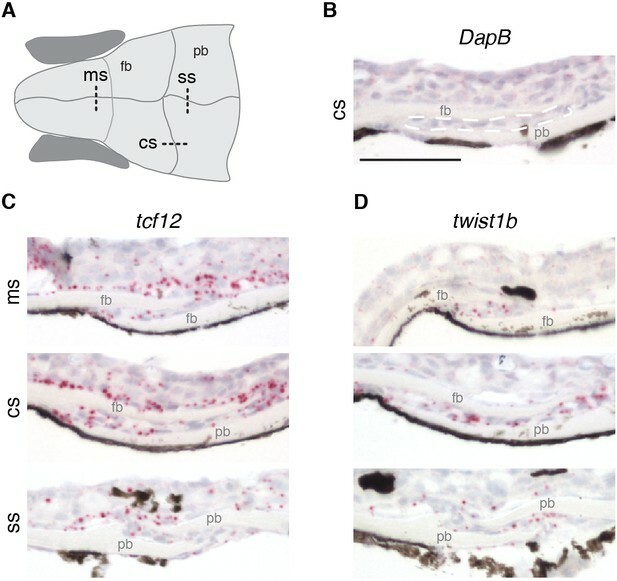 The similarity in the genetic interaction between Twist1 and Tcf12 in mice, humans, and fish, despite differences in the cell lineages that give rise to the bones, suggests that the underlying processes of coronal suture development and craniosynostosis are deeply conserved. We demonstrate that in tcf12; twist1b mutant fish, the frontal and parietal bones grow abnormally. In mutants, skull bones initiate normally, yet early bone growth is accelerated across the skull. However, subsequent bone growth selectively stalls at the future coronal suture that is destined to fuse. Moreover, sequential live imaging of individual mutant fish shows that the degree of later bone stalling predicts which animals will lose the coronal suture. We observe a similar misregulation of bone growth in Tcf12+/-; Twist1+/- mutant mice, with tissue-specific removal of Twist1 resulting in selective overgrowth of the frontal or parietal bones. Further, Twist1 function must be perturbed within both neural crest- and mesoderm-derived bones, and not just the mesoderm-derived postnatal sutural mesenchyme, to prevent suture formation. At least in mice, we find that these altered bone growth dynamics may be due to changes in osteoblast proliferation and eventual depletion of Gli1+ and Gremlin1+ putative bone progenitors prior to the fusion of the bones. These findings demonstrate that Tcf12 and Twist1 have a conserved early function during skull bone growth to regulate the sustained production of osteoblasts, possibly through maintenance of osteoprogenitors, and that the coronal suture is particularly sensitive to defects in this process. In order to investigate requirements for Tcf12 and Twist1 homologs in zebrafish suture formation, we designed TALE nucleases to generate mutant alleles for tcf12 and both zebrafish Twist1 homologs, twist1a and twist1b. The tcf12el548, twist1ael570, and twist1bel571 alleles result in premature truncations before the helix-loop-helix domains required for DNA-binding and dimerization, thus likely abrogating all protein function (Figure 1—figure supplement 1). Whereas individual homozygous mutants displayed no gross defects as embryos or adults and had patent sutures across the head (Figure 1B and Figure 1—figure supplement 2), 38% of tcf12; twist1b double mutant adults developed unilateral or bilateral coronal synostosis, as revealed by Alizarin Red staining of bone (Figure 1B). We confirmed loss of the coronal suture by micro-computed tomography scans and histology (Figure 1C,D). As in mice and humans, coronal suture loss correlated with reduced anterior-posterior growth of the frontal and parietal bones, and in cases where the suture was lost unilaterally we consistently observed reduced anterior-posterior growth on that side of the skull (Figure 1C). In contrast, we did not detect a requirement for twist1a in suture development; sutures formed normally in tcf12-/-; twist1a-/- mutants, and loss of twist1a alleles did not increase the severity or penetrance of suture defects in tcf12-/-; twist1b-/- fish (Figure 1—figure supplement 3, Supplementary file 1). Loss of tcf12 appears essential for synostosis, as rare adult viable twist1a-/-; twist1b-/- fish had normal sutures. While we only detected fusions of the coronal suture in tcf12-/-; twist1b-/- fish, we did observe other abnormalities in skull bones in different mutant combinations, including ectopic sutures and small gaps between the parietal bones (Figure 1—figure supplement 3, Supplementary file 1). Our results demonstrate that, as in humans and mice with reduced TCF12 and/or TWIST1 dosage, mutations in the homologous genes in zebrafish primarily result in loss of the coronal suture, although other calvarial defects are also rarely observed. Given the synergistic effect of tcf12 and twist1b loss on coronal suture formation, we examined whether tcf12 also interacts genetically with Twist1 genes in earlier craniofacial development. Similar to previous reports of zebrafish with antisense morpholino reduction of twist1a and twist1b (Das and Crump, 2012), and mice with neural-crest-specific deletion of Twist1 (Bildsoe et al., 2009), twist1a-/-; twist1b-/- zebrafish embryos displayed defects in the specification of skeletogenic ectomesenchyme from the neural crest. In wild-type embryos, neural crest expression of sox10 is down-regulated by 20 hr post-fertilization (hpf) as ectomesenchyme neural crest cells populate the pharyngeal arches. In twist1a-/-; twist1b-/- embryos, we observed persistent sox10 expression in arch ectomesenchyme and reductions in facial cartilage and bone at 5 days post-fertilization (dpf) (Figure 2A,B). Dorsal facial cartilages (e.g. palatoquadrate and hyosymplectic) were most affected (Figure 2C, Figure 2—source data 1), potentially reflecting the greater sensitivity of these elements to general neural crest defects (Cox et al., 2012) and/or post-migratory roles of Twist1 genes in branchial arch development (Askary et al., 2017). Interestingly, loss of tcf12 suppressed rather than enhanced the severity of facial skeletal defects in twist1a-/-; twist1b-/- larvae, with partial suppression seen with loss of just one tcf12 allele (Figure 2B,D, Figure 2—source data 2). The suppression did not appear to be due to a rescue of ectomesenchyme specification, as similarly persistent sox10 was evident in twist1a-/-; twist1b-/- embryos with or without tcf12 loss (Figure 2A). We also observed that loss of at least one copy of tcf12 enhanced adult viability of twist1a-/-; twist1b-/- mutants (Figure 2E, Figure 2—source data 3). These findings indicate temporally distinct genetic interactions between Twist1 and Tcf12, with Tcf12 acting antagonistically to Twist1 during arch development and synergistically during later skull bone growth and suture formation. Loss of tcf12 partially rescues twist1a; twist1b jaw cartilage defects and viability. (A) In situ hybridizations at 20 hpf show abnormal persistence of sox10 expression in arch ectomesenchyme (boxed region) in twist1a-/-; twist1b-/- and tcf12-/-; twist1a-/-; twist1b-/- mutants. Arrowheads indicate persistent sox10 expression in arches. (B) Unilateral dissections of the first and second arch skeletons stained with Alcian Blue (cartilage) and Alizarin Red (bone) at 5 dpf. Compared to the reductions of the upper facial skeleton in twist1a-/-; twist1b-/- mutants, tcf12-/-; twist1a-/-; twist1b-/- triple mutants display less severe defects. Scale bars, 250 µm. (C) Quantitation of wild-type and twist1a-/-; twist1b-/- jaw cartilage areas show specific reductions in more dorsal cartilages, the palatoquadrate (Pq) and hyosympletic (Hs). M, Meckel’s cartilage; Ch, ceratohyal. (D) Qualitative scoring of facial skeletal defects from Grade 0 (unaffected) to Grade 4 (most affected). Loss of one or two copies of tcf12 improved the facial skeletal morphology of twist1a-/-; twist1b-/- mutants. Wild type (wt, n = 20), twist1a-/-; twist1b-/- (12+/+, 1a-/-, 1b-/-, n = 25), tcf12+/-; twist1a-/-; twist1b-/- (12+/-, 1a-/-, 1b-/-, n = 32), tcf12-/-; twist1a-/-; twist1b-/- (12-/-, 1a-/-, 1b-/-, n = 22). Using a Fisher’s Exact Test, p=0.0032 for 12+/+, 1a-/-, 1b-/- versus 12-/-, 1a-/-, 1b-/- and p=0.001 for 12+/+, 1a-/-, 1b-/- versus 12+/-, 1a-/-, 1b-/-. (E) Reduction of tcf12 dosage improves adult viability of twist1a-/-; twist1b-/- mutants. From an incross of tcf12+/-; twist1a+/-; twist1b+/- fish, we obtained twist1a-/-; twist1b-/- mutants and assessed their viability to 3 months of age. After genotyping for tcf12, we observed a 4:36:12 ratio of tcf12+/+: tcf12+/-: tcf12-/-, compared to the predicted 13:26:13 ratio, which was significantly skewed as determined by a Chi-squared test (p=0.0062). Given the selective loss of the coronal suture in mutants, we examined whether tcf12 and twist1b genes might be selectively expressed in this suture. However, at a stage when sutures have just formed (14 mm standard length), we observed expression of tcf12 and twist1b within the mesenchyme of not only the coronal but also the metopic and sagittal sutures (Figure 3). Whereas twist1b expression was largely restricted to the suture mesenchyme, tcf12 expression was observed more broadly in the suture mesenchyme and cells surrounding the skull bones. Expression of tcf12 and twist1b at multiple sutures in fish is consistent with similarly broad suture expression of Twist1 in mice (Rice et al., 2000) and argues against genetic sensitivity of the coronal suture being due to selective expression of tcf12 and twist1b at this suture. Expression of tcf12 and twist1b in multiple sutures of zebrafish. (A) Schematic of the zebrafish skull depicting positions of sections (dotted lines) used for RNAscope in situ hybridizations. cs, coronal suture; ms, metopic suture; ss, sagittal suture; fb, frontal bone; pb, parietal bone. (B–D) In situ hybridizations on sections taken from zebrafish at 14 mm standard length. Red puncta indicate positive expression. DapB (B) was included as a negative control, with suture mesenchyme outlined in a dashed white line for reference. Expression of tcf12 (C) and twist1b (D) was detected in the metopic, coronal and sagittal suture mesenchyme, with tcf12 also expressed broadly outside the sutures. n = 3 for each experiment. Scale bar, 50 µm. We next investigated whether suture defects in tcf12; twist1b mutants might result from an earlier misregulation of skull bone growth, to which the coronal suture might be particularly sensitive. In wild-type zebrafish, the anlage of the frontal and parietal bones can first be seen at 6 mm standard length, with the coronal suture forming at the interface of these bones in a lateral to medial progression (Kague et al., 2016). Live mineralization stains revealed that initiation of the frontal and parietal bones was unaffected in mutants, yet accelerated growth of these bones became detectable in mutants by 8 mm, and more so by 9 mm (Figure 4A). Staining with the mineralization dye Calcein Green revealed accelerated frontal bone fronts by 10.25 ± 0.25 mm in mutants, with no difference in the degree of increased bone between sides that developed synostosis and those that did not (Figure 4B,C, Figure 4—source data 1). Although the overall area of the mutant parietal bone was comparable to that of wild types at 10.25 ± 0.25 mm, both the mutant frontal and parietal bones were aberrantly shaped. In particular, both the frontal and parietal bones exhibited enhanced growth along an axis diagonal to the anterior-posterior and medial-lateral axes, which themselves exhibit little to no changes in directional growth (Figure 4C, Figure 4—source data 2). Such enhanced diagonal growth would be expected to bring the frontal and parietal bones closer together at the forming coronal suture, particularly in the medial region most commonly affected in mutants (Figure 4B). Likewise, the lack of enhanced medial-lateral growth of the parietal bones correlates with the sagittal suture being unaffected in mutants. Altered bone growth dynamics precede craniosynostosis in mutant zebrafish. (A) Dorsal views of the developing skull bones in the same wild-type and mutant individuals across four developmental stages. Live fish were stained with Calcein Green at 6, 7, and 8 mm and Alizarin Red at 9 mm. For the right sides, arrows show initiation of the frontal bone at 6 mm and dashed lines show the frontal (left) and parietal (right) fronts at successive later stages. (B) Individual wild-type and tcf12; twist1b mutant fish were stained with Calcein Green at 10.25 ± 0.25 mm, recovered, and then stained again with Alizarin Red and imaged at 14 ± 0.5 mm. These same fish were then grown to 20 mm, at which stage they were fixed and stained again with Alizarin Red to assess suture patency. White dotted lines indicate bone generated by 10.25 mm. Arrowheads indicate missing coronal suture. Scale bars, 1 mm. (C) Quantification of calvarial bone growth. Bone produced by 10.25 ± 0.25 mm was calculated based on the area (µm) stained with Calcein Green (white outlines in B). At 10.25 mm, compared to control frontal bones (n = 12), tcf12; twist1b mutant frontal bones that developed synostosis later (n = 11) and those that did not (n = 11) showed similar increases in bone formation. Bone shape was assessed by overlaying tracings of posterior frontal bones and parietal bones for wild types and mutants. Specific growth directionality in the anterior-posterior, medial-lateral, and diagonal axes were measured and quantified (green arrows). (D) Bone growth from 10.25 ± 0.25 mm to 14 ± 0.5 mm was analyzed in respect to prospective suture zones. Growth in the metopic (yellow) and sagittal (blue) zones did not differ significantly in controls versus tcf12; twist1b mutants, which correlated with no defects in these sutures in mutants. In contrast, growth in the coronal zone was reduced in tcf12; twist1b mutants, with a more pronounced decrease in mutant sides that later developed synostosis. p values were determined by Student’s t-tests; error bars represent standard error of the mean. Subsequent sequential staining with Alizarin Red unveiled a marked decrease in bone growth in mutants from 10.25 ± 0.25 to 14 ± 0.5 mm at the future coronal but not the metopic or sagittal sutures (Figure 4D, Figure 4—source data 3, Figure 4—source data 4, Figure 4—source data 5). We further took advantage of the variable penetrance of suture defects to correlate the degree of bone stalling with later suture loss in individual tcf12; twist1b mutants. Consistently, synostotic sides exhibited greater reductions in earlier bone growth compared to mutant sides that had patent sutures. Thus, the degree to which the growth of the mutant parietal and frontal bones slows in the coronal zone predicts later loss of this suture. Reciprocally, the absence of bone stalling at the future metopic and sagittal zones is consistent with these sutures being unaffected in mutants. We next examined the cellular mechanisms underlying altered bone growth in mutants. Analysis of an sp7:EGFP transgenic line, which labels Sp7+ osteoblasts, revealed accelerated frontal and parietal bone fronts along the diagonal axis in tcf12; twist1b mutants versus sibling controls at 10 mm (Figure 5—figure supplement 1), consistent with our analysis using mineralization dyes. We then used BrdU incorporation in combination with anti-Sp7 antibody staining to assess the numbers of proliferative cells at the growing fronts of the frontal and parietal bones at an earlier 9 mm stage. Analysis of Sp7+ osteoblasts revealed acceleration of frontal and parietal bone growth, with the leading edges of the bones appearing uneven (Figure 5A; additional examples in Figure 5—figure supplement 2). After digitally extracting the bone fronts to avoid signals from the highly proliferative skin, we quantified the numbers of proliferative cells at the fronts. Along both the mutant frontal and parietal bone fronts, we observed an increase in the percentage of Sp7+ osteoblasts undergoing proliferation, and a trend toward increased numbers of proliferative Sp7- cells just ahead of the bone fronts (Figure 5B,C, Figure 5—source data 1, Figure 5—source data 2). These results suggest that increased proliferation of early osteoblasts, and potentially also osteoprogenitors, contribute to the initial acceleration of bone growth across the mutant skull. Altered proliferation and osteoblast production at mutant zebrafish bone fronts. (A) Dissected skullcaps were stained for BrdU (magenta) and Sp7 protein (green) at 9 mm. Top panels show maximum intensity projections of whole skull volumes, and middle panels are the same volumes but processed to extract the bone fronts (note that much of the BrdU staining in the center of the top images is in the skin). Bottom panels show enlarged regions of the osteogenic fronts (dotted rectangles). White arrows show proliferative osteoblasts (BrdU+/Sp7+) and magenta arrows show adjacent proliferative Sp7- cells. fb, frontal bone; pb, parietal bone. Scale bars, 300 µm for whole skull view, 100 µm for enlarged view. (B, C) Based on the extracted osteogenic fronts (middle panels in A), we quantified the percentage of Sp7+ osteoblasts that were BrdU+ (B) and the number of adjacent BrdU+/Sp7- cells per area (C). Wild-type controls, n = 20; tcf12; twist1b mutants, n = 28. p values were determined by a Student’s t-test; error bars represent standard error of the mean. 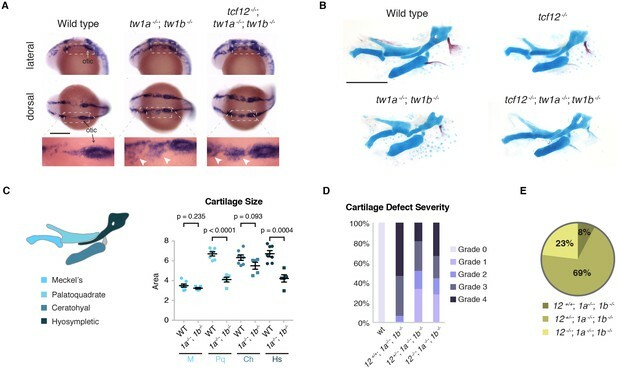 Given the similarity of coronal suture defects in tcf12-/-; twist1b-/- fish and Tcf12+/-; Twist1+/- mice, we investigated whether earlier alterations in calvarial bone growth might also prefigure suture loss in mice. At embryonic day (E) 13.5, when skull bone rudiments are first apparent, alkaline phosphatase staining revealed accelerated frontal and parietal bones that were in closer apposition in Tcf12+/-; Twist1+/- mutants versus wild-type sibling controls (Figure 6A). At birth, mutant frontal and parietal bones were more closely apposed than in controls and had abnormal shapes (Figure 6B). Next, we assessed proliferation rates and osteoblast density at the forming coronal suture (E14.5) and sagittal suture (E16.5) (Figure 6C, outlined regions of bottom panels). In mutants, we observed thicker bone fronts, as marked by Sp7+ cells (Figure 6—figure supplement 1, Figure 6-figure supplement 1-Source Data 1), as well as a marked increase in the number of Sp7+ osteoblasts at the bones fronts predestined for the coronal and sagittal sutures (Figure 6D, Figure 6—source data 1). We also observed an increase in the number of proliferative Sp7- cells immediately adjacent to osteoblasts at the bone fronts, with this increase more evident at the forming coronal versus sagittal suture (Figure 6E, Figure 6—source data 2). In contrast to fish, we noted a decrease in the number of proliferative osteoblasts at the forming coronal suture, and no change at the forming sagittal suture (Figure 6F, Figure 6—source data 3). These findings largely support a conserved role for Tcf12 and Twist1 in negatively regulating the number of proliferative cells at the growing bone fronts in fish and mice. Altered bone growth dynamics in Tcf12+/-; Twist1+/- mice. (A) Lateral views of E13.5 mouse heads show Alkaline phosphatase staining of developing frontal and parietal bones. Dotted lines indicate the bone fronts that will form the coronal suture. Compared to wild types (n = 5), the fronts were accelerated in all Tcf12+/-; Twist1+/- mutants (n = 12). Scale bar, 1 mm. (B) Dorsal views of skull bones stained with Alizarin Red at birth (P0). Compared to wild types (n = 5), the fronts were closer together in all Tcf12+/-; Twist1+/- mutants (n = 11). Scale bar, 1 mm. (C) Sections of E14.5 coronal sutures and E16.5 sagittal sutures stained for BrdU (magenta), Sp7 protein (green), and DAPI (blue, nuclei). Boxed regions are magnified in lower panels, with yellow dotted lines indicating the regions of interest (ROI) used for quantification. fb, frontal bone; pb, parietal bone. Scale bar, 100 µm. (D–F) Quantification of Sp7+ osteoblasts per ROI (D), BrdU+Sp7- bone front cells per ROI (E), and the percentage of Sp7+ osteoblasts that are BrdU+ in the ROI (F). Cell counts were performed at the developing coronal sutures (cs, four wild types, three mutants) and sagittal sutures (ss, six wild types, six mutants). p values were determined by Student’s t-tests; error bars represent standard error of the mean. We next investigated whether the lack of continued bone growth at the mutant coronal fronts might reflect an exhaustion of osteoprogenitor cells. In mouse, sutural stem cells express Prrx1 (Wilk et al., 2017) and Gli1 (Zhao et al., 2015). Grem1 also marks skeletal stem cells throughout the animal (Worthley et al., 2015), yet a role in the skull and sutures has not been previously examined. Using RNAscope in situ hybridization technology in zebrafish, we find that prrx1a is broadly expressed at the parietal and frontal bone fronts destined for the coronal and sagittal sutures, as well as the periosteum, at 10 mm, and in the sutures and periosteum at adult stages (Figure 7A,B). The expression of gli1 and grem1a appears more restricted to the growing bone fronts and suture mesenchyme, although we also see more general periosteal expression at earlier stages. In tcf12; twist1b mutants, we still observe cells expressing gli1, grem1a, and prrx1a at the forming coronal and sagittal sutures, as well as within the periosetum (Figure 7A,B), with quantitation revealing similar levels of each gene on a per cell basis (Figure 7—figure supplement 1A, Figure 7—figure supplement 1—source data 1, Figure 7—figure supplement 1—source data 2). At the coronal suture, we observed that the mutant frontal and parietal bones were more closely apposed than in stage-matched wild-type siblings, which could possibly be a consequence of depleted progenitors at the bone fronts. In adult mutants with fused coronal sutures, we failed to detect gli1+, grem1a+, or prrx1a+ cells in the coronal suture region, whereas prrx1a was still expressed in the periosteum (Figure 7A). Normal expression of all three markers was observed at the patent sagittal suture. We also examined Fgf signaling in zebrafish mutants, as the expression of Fgfr2 has been reported to be altered in mouse Twist1 heterozygous animals (Rice et al., 2000; Connerney et al., 2006). As with gli1, grem1a, and prrx1a, we still observed cells expressing fgfr2 and the Fgf target gene dusp6 at the mutant coronal suture (Figure 7—figure supplement 1B, Figure 7—figure supplement 1—source data 3), arguing against the calvarial phenotypes being due to wholesale loss of Fgfr2 signaling at the bone fronts. Reduced osteoprogenitor pool at the mutant coronal suture. (A, B) Sections of forming coronal and sagittal sutures of 10 mm fish and fully formed sutures of adult fish were assessed for gli1, grem1a, and prrx1a mRNA expression (white) by RNAscope in situ hybridization. Orange dotted lines indicate bones, and the boxed regions of the coronal suture regions are magnified below. For adult sutures, yellow arrowheads show expression in the suture mesenchyme, yellow arrows show expression of prrx1a in the periosteum, and grew arrows show lack of expression of gli1 and grem1a in the periosteum. Scale bar at 10 mm stage, 20 µm; scale bar at adult stage, 50 µm. (C, D) Sections of E14.5 coronal sutures and E16.5 forming sagittal sutures of mice stained for Gli1/Grem1 (magenta) and Sp7 protein (green). Yellow arrowheads indicate progenitor regions in forming coronal sutures. Boxed regions of parietal bone fronts in the forming sagittal sutures are magnified in lower panels. Nuclei are stained blue by DAPI in all images. Scale bars, 100 µm. 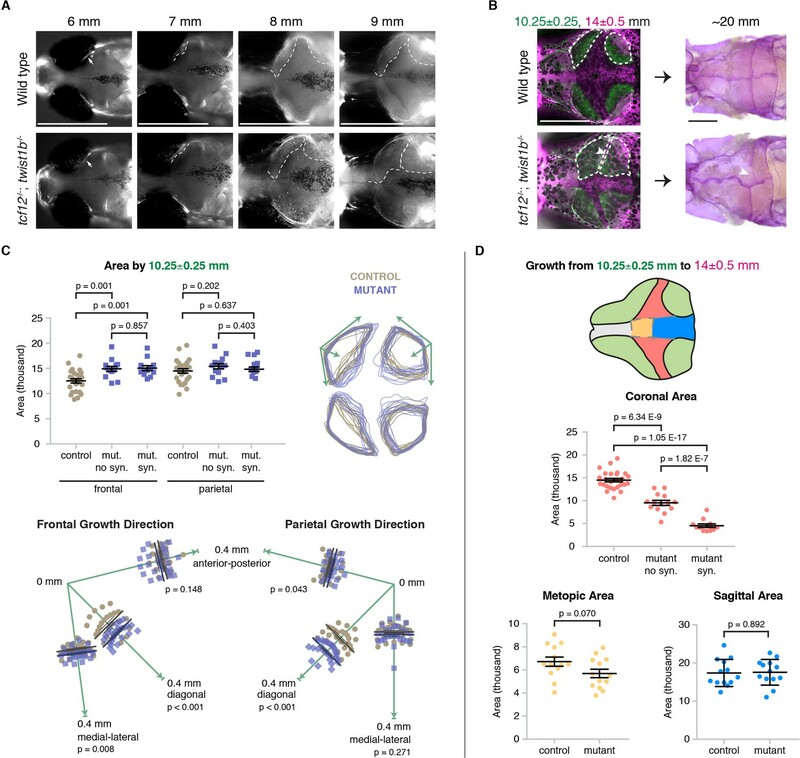 Given the difficulty in quantitating the numbers of osteoprogenitors at the forming coronal suture zone of mutant zebrafish, owing in part to the small sizes of these bone fronts, we also examined putative progenitors in mutant mice. As in zebrafish, we observed cells expressing Gli1 and Grem1 protein at and around the fronts of the embryonic frontal and parietal bones. In Tcf12+/-; Twist1+/- mice, we observed a marked reduction in the number of Gli1+ and Grem1+ putative progenitors at and around the developing coronal but not the sagittal bone fronts (Figure 7C,D). 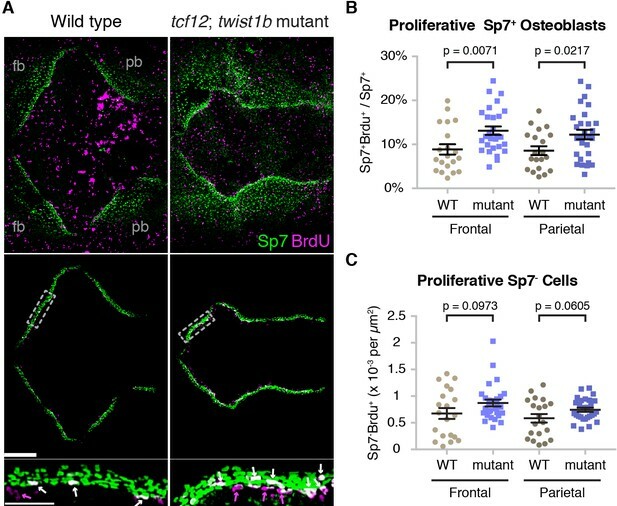 These findings highlight a conserved molecular signature of putative osteoprogenitors and sutural stem cells of zebrafish and mice and suggest, at least in mice, a selective exhaustion of osteoprogenitors at the developing coronal suture. To investigate whether Twist1 functions tissue-intrinsically for proper skull bone growth, we took advantage of the unique germ-layer origins of the mammalian frontal and parietal bones to remove one copy of Twist1 in each tissue. At postnatal day (P) 21, we found that reduced dosage of Twist1 in the neural-crest-derived precursors of the frontal bone, in Wnt1-Cre; Twist1flox/+ mice, resulted in the overgrowth of the frontal bone relative to the parietal bone, which we quantified by measuring the ratio of the sagittal to metopic suture (Figure 8, Figure 8—source data 1). 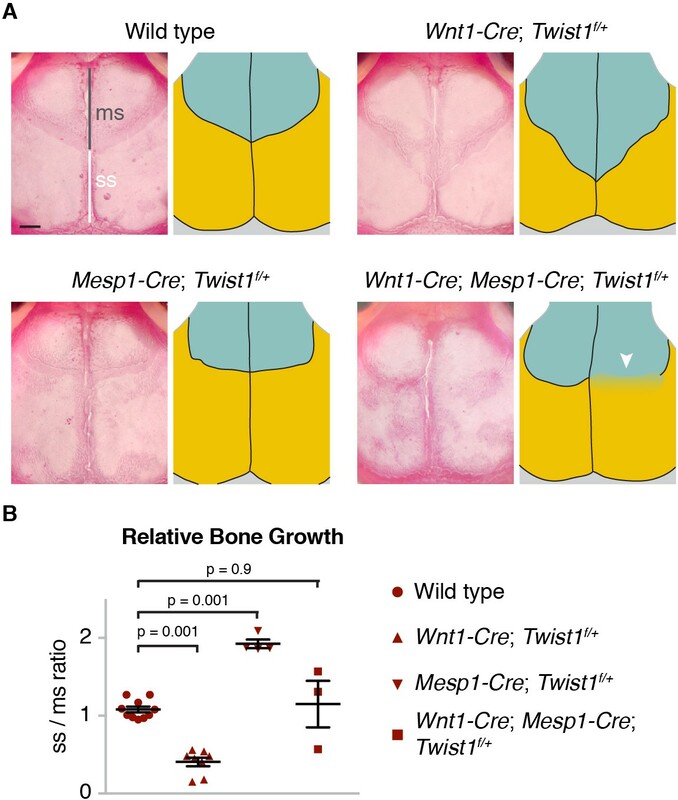 Reciprocally, removing one copy of Twist1 from the mesoderm-derived parietal bone, in Mesp1-Cre; Twist1flox/+ mice, resulted in its overgrowth relative to the frontal bone. Reduced dosage of Twist1 in both the neural crest and mesoderm, in Wnt1-Cre; Mesp1-Cre; Twist1flox/+ mice, normalized the relative sizes of the frontal and parietal bones and resulted in loss of the coronal suture, a phenotype not seen upon deletion of Twist1 in neural crest or mesoderm alone. We conclude that Twist1 negatively regulates bone growth in both the neural-crest- and mesoderm-derived portions of the skull, and that Twist1 must be mutated in not only the mesoderm-derived parietal bone and suture mesenchyme, but also the neural-crest-derived frontal bone, to impact coronal suture formation. Tissue-autonomous bone overgrowth in Twist1 conditional mutants. (A) Dorsal views of Alizarin-stained skulls of three-week-old mice. In the accompanying diagrams, turquoise indicates the neural-crest-derived frontal bones and gold the mesoderm-derived parietal bones. The relative lengths of the metopic suture (ms) and sagittal suture (ss) serve as a proxy for bone size. Compared to wild type (n = 0/10), Wnt1-Cre; Twist1flox/+ (n = 0/8), and Mesp1-Cre; Twist1flox/+ (n = 0/4); Wnt1-Cre; Mesp1-Cre; Twist1flox/+ mice (n = 2/3) displayed coronal synostosis (arrowhead, average craniosynostosis index of 2.33). Scale bar, 1 mm. (B) Quantification of the relative length of the sagittal over the metopic suture. p values were determined by a one-way ANOVA with post-hoc Tukey-Kramer HSD test; error bars represent standard error of the mean. Discovery of a selective requirement for tcf12 and twist1b in coronal suture formation in zebrafish has allowed us to gain a better understanding of the developmental basis of suture loss in Saethre-Chotzen syndrome. 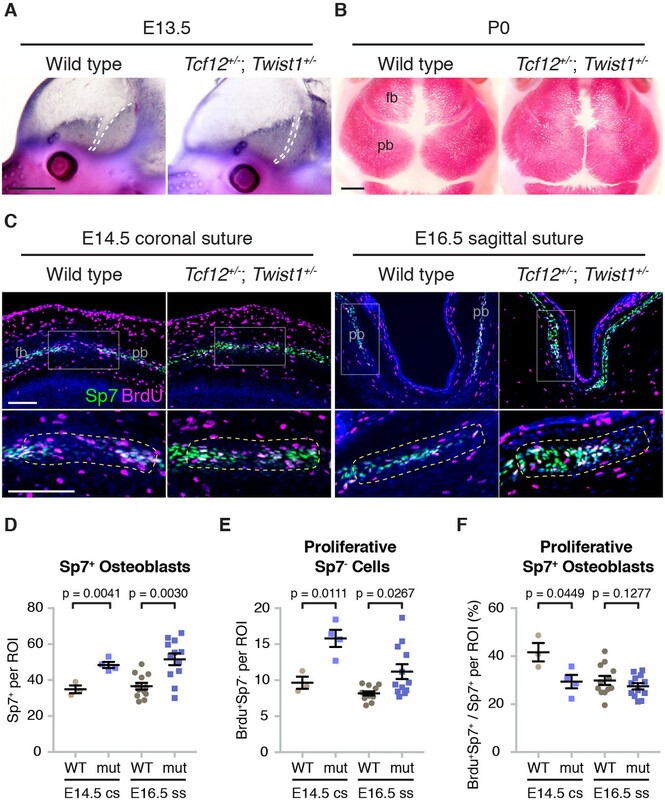 The similarity of coronal suture defects from humans to mice to zebrafish is striking, although each species displays unique dosage sensitivities to loss of TWIST1 and TCF12. In humans, haploinsufficiency of TWIST1 or TCF12 can lead to suture loss. In mice, haploinsufficiency of Twist1 also results in coronal suture loss, yet haploinsufficiency of Tcf12 does not, despite enhancing the penetrance of suture defects in Twist1+/- mice (Sharma et al., 2013). In zebrafish, only loss of one of two Twist1 homologs (twist1b) along with loss of tcf12 results in suture loss. It remains unclear why humans are more sensitive to Twist1 and Tcf12 dosage than mice and zebrafish, although a similar phenomenon has been observed with other synostosis genes (e.g. JAG1) (Teng et al., 2017). Repeated live imaging of individual mutant fish revealed a strong correlation between the extent of altered bone growth and later suture loss. Whereas the initiation of the frontal and parietal bones was largely unaffected in mutants, we observed increased proliferation and osteoblast production at the mutant bone fronts in both fish and mice. There were some subtle differences between fish and mice, with larger increases in proliferative osteoblasts in mutant fish than mice, which might reflect species-specific or staging differences. Nonetheless, mutants in both species displayed accelerated growth of both the frontal and parietal bones, which often resulted in abnormal shapes likely due to growth variations along individual bone fronts. In particular, we found that increased diagonal growth in mutants brought the parietal and frontal bones together at the prospective medial regions of the coronal suture much earlier than in wild type animals, which correlates with the medial region of the coronal suture being most commonly fused in mutants. This altered directional growth might be one reason why the coronal suture is preferentially affected in both zebrafish and mouse Twist1/Tcf12 mutants, despite the different origins of the coronal suture in these species. Another prominent finding was a lack of continued bone growth at the future coronal but not other sutures in mutants, with the degree of bone stalling predicting synostosis in individuals. We identified Gli1/gli1 and Grem1/grem1a as conserved markers of putative osteoprogenitors in both the growing bone fronts and mature sutures of mice and zebrafish, although both genes display broader expression at early stages of calvarial bone development, including in some periosteal cells. Future lineage tracing experiments should help reveal the extent to which gli1 in fish and Grem1/grem1a in both species mark similar populations of embryonic osteoprogenitors and postnatal sutural stem cells. A previous study had observed reduced expression of Gli1 in the sutures of adult Twist1+/- mice (Zhao et al., 2015). Here, we extend this finding to embryonic stages when the coronal suture is forming, and uncover the existence of Grem1+ cells in and around the bone fronts of the nascent coronal suture that become depleted in mutant mice. Whether similar osteoprogenitors become exhausted at the developing coronal suture of zebrafish remains to be determined, as it was difficult to precisely quantify the numbers of these progenitors by RNA expression alone. One possibility is that reduced Twist1 and Tcf12 function alters the balance between long-term sutural stem cells (i.e. those marked by Gli1) and proliferative osteoblasts and their immediate progenitors. In such a model, the early increase in osteoblast production would come at the expense of long-term progenitors, thus leading to a later failure of continued bone growth and a loss of the sutural stem cells that would normally separate the skull bones. In addition to further verifying this model, an important next step will be to determine why the fronts of the parietal and frontal bones abutting the future coronal suture are most sensitive to progenitor exhaustion in mutants. We did not observe preferential expression of tcf12 and twist1b at the coronal suture in fish, consistent with similarly broad sutural expression of Twist1 in mice (Rice et al., 2000). Instead, osteoprogenitors in the coronal zone could be fewer in number at initial stages and/or more sensitive to loss of Tcf12 and Twist1, for example due to compensation by related genes at other sutures. Further support for suture defects arising from much earlier changes in bone growth come from our conditional Twist1 deletion experiments in mouse. Whereas the frontal bone arises from neural crest and the parietal bone from mesoderm, the mesenchyme within the postnatal coronal suture is largely mesoderm-derived (Yen et al., 2010). However, suture loss was only observed upon conditional deletion of one allele of Twist1 from both the embryonic mesoderm and neural crest. This finding is inconsistent with Twist1 functioning solely in the mesoderm-derived postnatal suture mesenchyme for suture patency, instead suggesting that misregulated growth of both the frontal and parietal bones is required to later disrupt the coronal suture in Twist1 mutants. Our study highlights a selective role for Tcf12 in the later growth of the skull bones and patency of the coronal suture. In contrast to animals lacking Twist1 homologs, zebrafish lacking tcf12 do not display embryonic lethality or defects in ectomesenchyme and facial cartilage formation. Instead, loss of tcf12 partially suppresses the facial cartilage defects and lethality of twist1a; twist1b mutants. Suppression of embryonic defects could be due to loss of competition of Tcf12 with other Twist binding partners, such as Hand2 (Firulli et al., 2005). In this scenario, maternal Twist1a/b and/or other Twist family members (e.g. twist2 and twist3) could compensate for lack of zygotic Twist1a/b. Loss of tcf12 would then allow remaining Twist proteins to more effectively form homodimers or alternate heterodimers important for embryogenesis. Whereas a previous report indicates that Tcf12 and Twist1 can form heterodimers (Connerney et al., 2006), it is also possible that Tcf12 has Twist1-independent functions that antagonize Twist1 during embryogenesis. Future efforts to directly visualize Tcf12-Twist1 complexes will help to resolve how Tcf12 promotes Twist1 function during skull bone growth while counteracting it during embryonic neural crest development. Development of homologous structures often employs ancestrally conserved gene regulatory networks. For example, a requirement for Pax6 genes in eye development in a wide range of animals has been used to argue for deep homology of eye structures (Gehring and Ikeo, 1999). Here, we show remarkably specific loss of a single anatomical structure, the coronal suture, in zebrafish and mice lacking Tcf12 and Twist1, despite this suture occurring at a mesoderm/mesoderm interface in zebrafish and a neural-crest/mesoderm interface in mice. Hence, sensitivity of the coronal suture in Saethre-Chotzen syndrome is unlikely to be due to its location at a unique neural-crest/mesoderm interface. 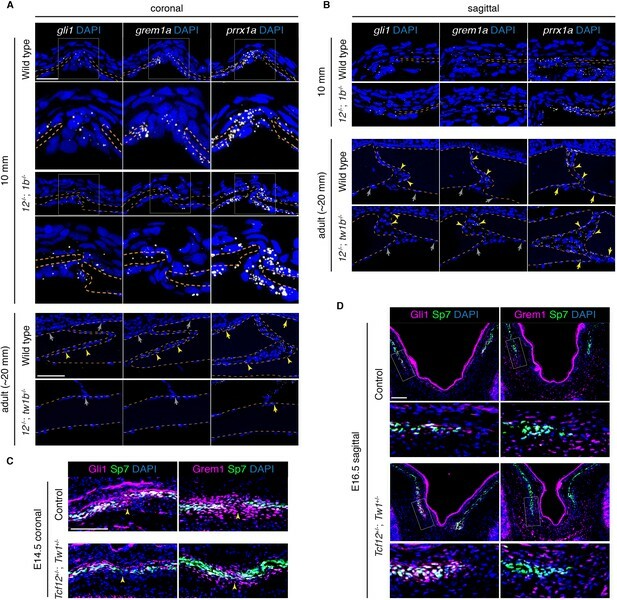 In addition, there are several other sutures occurring at a neural-crest/mesoderm interface in mice and fish that are not affected by loss of Tcf12 and Twist1. There has been on-going debate, given these distinct tissue boundaries, as to whether coronal sutures are truly homologous across vertebrates (Maddin et al., 2016). Our data indicate that the conserved genetic dependence of the coronal suture in fish and mammals likely reflects a similar sensitivity to early bone growth changes, perhaps owing to similar developmental and anatomical constraints irrespective of the embryonic origins of the bones flanking this suture. (University of Texas, M. D.
The University of Southern California Institutional Animal Care and Use Committee approved all animal experiments, and all methods were performed in accordance with the relevant guidelines and regulations. Zebrafish (Danio rerio) embryos were raised in Embryo Medium (Westerfield, 2007) at 28.5°C. Juvenile and adult fish were housed in groups of 10–15. Mutant lines were maintained on a mixed Tubingen wild-type (Haffter et al., 1996), casper (White et al., 2008), and sp7:EGFP background. Three targeted mutant lines (tcf12el548, twist1ael571, and twist1bel570) were generated for this study (see below). Lines were propagated by genotyping fin biopsies. As we found that twist1a loss did not effect the penetrance or expressivity of suture loss in tcf12-/-; twist1b-/- fish (Supplementary file 1), we pooled tcf12-/-; twist1b-/- fish with any twist1a genotype for the experiments. Mice (Mus musculus) were housed in cages with no more than five adults or three adults with one litter per cage. The Tcf12 (Wojciechowski et al., 2007), Twist1 (Chen and Behringer, 1995), conditional Twist1-flox (Bildsoe et al., 2009), Wnt1-cre (Danielian et al., 1998), and Mesp1-cre (Saga et al., 1999) alleles were genotyped as described. Zebrafish mutant for tcf12, twist1a, or twist1b were generated with TALEN-based targeted mutagenesis. TALEN constructs were generated using the PCR-based platform (Sanjana et al., 2012) and digested with StuI (New England Biolabs, Ipswich, MA). RNAs were synthesized from linearized constructs using the mMessage mMachine T7 Ultra kit (Ambion/Life Technologies, Carlsbad, CA, USA). TALEN RNAs were injected at 100 ng/μl into 1-cell-stage embryos, and we identified mosaic germline founders by sequencing their progeny. The tcf12el548 allele includes base pair changes and insertions that disrupt a common exon shared in all protein-coding transcript variants. The twist1ael571 and twist1bel570 alleles are deletions that interrupt the coding sequence close to the translation start site. All three alleles are frame-shift mutations that result in premature stop codons upstream of the helix-loop-helix DNA-binding domains. Detailed sequences of TALEN targets and genotyping primers are listed in Supplementary file 2. Adult zebrafish were fixed overnight at 4°C with 4% paraformaldehyde, washed with 0.5% KOH for at least half an hour, cleared with 3% H2O2 in 0.5% KOH for several hours until pigmentation was removed, washed with 35% NaBO4 for at least half an hour, incubated with 1% trypsin in 35% NaBO4 for several hours until tissue was reasonably cleared, washed with 10% glycerol in 0.5% KOH for at least one hour, stained with 0.02% Alizarin Red S (Amresco 9436) pH 7.5 in 10% glycerol and 0.5% KOH overnight, washed with 50% glycerol/0.5% KOH until residual stain was removed, and stored in 100% glycerol. Skullcaps were dissected and imaged using a Leica S8 APO stereomicroscope. The heads of newborn mice were skinned and cleared with 1% KOH for 1 to 2 days, stained with 2% Alizarin Red S in 1% KOH until mineralized bone was red, and stored in 100% glycerol. Mouse skulls were imaged using a Leica MZ125 stereomicroscope. Data was collected on a Nikon Metrology Xt S 225 ST with the following parameters: energy at 120kV; current at 26 uA; 3141 projections at two frames/sec and averaging two frames; no filter; and at 6 μm resolution. Two-dimensional slices were rendered into three-dimensional reconstructions using Arivis (Phoenix, AZ). Whole zebrafish were embedded into paraffin according to standard protocol. Briefly, fish heads were fixed with 4% paraformaldehyde at 4°C or 10% neutral buffered formalin at room temperature overnight, washed with PBS for half an hour each time, and then separated into heads and trunks. Heads were decalcified with 20% EDTA pH 8.0 for 10 days at room temperature, washed with DEPC-treated water, dehydrated through a series of sequentially increasing ethanol to DEPC water ratios, treated through a series of sequentially increasing Hemo-De (xylene substitute) to ethanol ratios, washed in 50% paraffin in Hemo-De at 65°C for one hour, incubated at 65°C in 100% paraffin overnight, embedded in paraffin in molds, and allowed to solidify at room temperature. Paraffin blocks were cut into 5 μm sections using a Shandon Finesse Me + microtome (cat no. 77500102) and collected on superfrost plus slides (Thermo Fisher Scientific). For tissue histology, hematoxylin and eosin staining was performed according to standard protocol. Briefly, sections were deparaffinized in xylene and ethanol, rinsed in water, stained with hematoxylin, rinsed in 4% glacial acetic acid, rinsed with water, washed with blueing solution, rinsed with water, dried with ethanol, stained with eosin, washed with ethanol and Hemo-De, and mounted with cytoseal. For whole-mount alkaline phosphatase staining, E13.5 mouse heads were fixed in 4% paraformaldehyde in PBS, bisected mid-sagitally after fixation, and stained with NBT and BCIP. Sections were imaged on a Leica DM2500 compound microscope. Colorimetric in situ hybridization using a sox10 digoxigenin-labeled riboprobe was performed on 20 hpf zebrafish embryos as described (Cox et al., 2012). Briefly, embryos were fixed, dehydrated with an increasing methanol series, and stored in 100% methanol at −20°C until use. Embryos were then rehydrated with a decreasing methanol series, treated with 1 μg/ml Proteinase K for 6.6 min, post-fixed with 4% PFA, incubated with hybridization buffer (50% formamide, 5X SSC, 100 μg/ml yeast RNA, 50 μg/ml heparin, 0.125% Tween-20, citric acid to pH 6), hybridized with probe, washed with solution series with decreasing formamide and SSC, incubated in blocking solution (5 mg/ml BSA, 5% sheep serum), treated with sheep digoxigenin-AP at 1:10,000, stained with NBT and BCIP (Roche), and color was allowed to develop for two and a half hours. Stained embryos were imaged on a Leica DM2500 compound microscope. RNAscope in situ hybridization was performed with the RNAscope 2.5 HD Assay – RED (Advanced Cell Diagnostics, Newark, CA) or the RNAscope Multiplex Fluorescent Kit v2 (Advanced Cell Diagnostics, Newark, CA) according to the manufacturer’s protocol for formalin-fixed paraffin-embedded sections. Probes include twist1b (C1), tcf12 (C2), prrx1a (C1), grem1a (C1), gli1 (C3), fgfr2 (C1), and dusp6 (C3). Alcian Blue (cartilage) and Alizarin Red S (bone) staining was performed on 5 dpf zebrafish larvae as previously described (Walker and Kimmel, 2007). Briefly, larvae were fixed for one hour in 2% paraformaldehyde, rinsed in 100 mM Tris pH 7.5 in 10 mM MgCl2, incubated overnight in Alcian Blue solution (0.04% Alcian Blue, 80% ethanol, 100 mM Tris pH 7.5, 10 mM MgCl2), rehydrated through a sequentially decreasing series of ethanol to 100 mM Tris pH 7.5 and 10 mM MgCl2 ratio, bleached with 3% H2O2 in 0.5% KOH under a lamp, washed with 25% glycerol in 0.1% KOH, stained with Alizarin Red S (0.01% Alizarin Red, 25% glycerol, 100 mM Tris pH 7.5), and de-stained with 50% glycerol in 0.1% KOH. Dissected jaw cartilages were mounted in 50% glycerol on a slide and imaged with a Leica DM2500 compound microscope. Fish were anesthetized, measured for body length, and recovered in Calcein Green stain (3 mg/30 ml, Molecular Probes C481) overnight in the dark. The following day, fish were washed in fish system water at least twice for one hour each time before imaging with a Zeiss AxioZoom microscope and returned to tanks on system. This process was repeated at a later time point with Alizarin Red S (1 mg/30 ml). Anesthetized fish were measured for body length and incubated in 4.5 mg/ml BrdU solution (B5002, Sigma Aldrich) for two hours in the dark. Fish were then transferred to fish system water or embryo medium for 15 min before euthanasia. Heads were fixed in 4% paraformaldehyde overnight before skullcaps were dissected and stored in PBS at 4°C. For mouse embryos at E14.5 and E16.5, BrdU was injected into the pregnant female (200 μg/g body weight) 2 hr prior to dissection. Heads of embryos were embedded in OCT medium (Histoprep, Fisher Scientific) before sectioning. Frozen sections were cut at 10 μm. Immunohistochemistry was performed using rat anti-BrdU (MCA2060 GA, Bio-Rad), rabbit anti-Osx/Sp7 (sc-22536-r, Santa Cruz), goat anti-Grem1 (PA5-47973, Thermo Fisher), or goat anti-Gli1 (AF3455, R and D Systems) diluted in 1% BSA/PBS and incubated overnight at 4°C. Detection of primary antibodies was performed by incubating goat anti-rat FITC (sc-2011, Santa Cruz), goat anti-rabbit Alexa Fluor 568 (A-11011, Thermo Fisher Scientific), or donkey anti-goat Alexa Fluor 488 (ab150129, Abcam) for 1 hr at room temperature followed by DAPI counterstaining. Severity of coronal synostosis was quantified using a coronal synostosis scoring index that was adapted from Oram and Gridley’s craniosynostosis index (Oram and Gridley, 2005). Left and right sutures were given scores of 0 (no fusion), 1 (<50% fused), 2 (≥50% fused), or 3 (completely fused). A composite score for each animal was calculated by adding the sum of both suture scores. The index value was determined by the sum of composite scores in each genotype group divided by the number of animals in the group. The degree of jaw cartilage defect was determined by the number of cartilage elements affected, with more affected equating to a higher grade of severity. Flat-mounted cartilages were measured for area using Fiji. Directional bone growth was quantified using Fiji. For bone produced by 10.25 mm and subsequent growth by 14 mm, bone regions were drawn freehand and measured for area. For assessment of BrdU+ and Sp7+ cells, tiled z-stacks were captured of stained zebrafish skulls caps using a Zeiss LSM 800. The bone fronts were then digitally extracted using a 30-pt. brush in Amira software, and cells were manually counted in a 3D view on Imaris software. In mouse coronal suture sections, the region of interest was determined by a defined length across the bone fronts and suture. In mouse sagittal suture sections, defined lengths included several cell diameters medial from the last Sp7+ cell at the bone fronts and accounted for bone curvature. Five sections per animal were quantified and averaged. For bone thickness quantifications, a perpendicular measurement across the broadest point of Sp7+ cells was measured for each section. All measurements and counting were completed in Fiji. For the quantification of RNAscope experiments, regions of interests were defined by the edge of the calvarial bones (imaged by DIC microscopy) in Fiji. The coronal progenitor region was defined as the space between the neighboring frontal and parietal bones, and the sagittal progenitor region was defined as an approximately three-cell layer length region ahead of the parietal bone. RNAscope signal was quantified across a Z-stack projection using the 3D Object Counter tool, and measurements above a pre-defined unit of one transcript were adjusted to account for closely packed transcripts. The final transcript count was normalized to the area of the region of interest. Three sections per animal were averaged for each probe. Unpaired t-tests were performed for all statistical analyses, and all samples were scored blindly. Wiley Interdisciplinary Reviews: Developmental Biology 5:429–459. Frontiers of Oral Biology 12:160–177. Current Topics in Developmental Biology, 115, 10.1016/bs.ctdb.2015.07.004, 26589924. American Journal of Medical Genetics 112:176–180. The American Journal of Human Genetics 89:595–606. Royal Society Open Science 3:160356. Eugene, OR: University of Oregon Press. The Journal of Immunology 178:5717–5726. Thank you for sending your article entitled "Altered progenitor dynamics prefigure craniosynostosis in a zebrafish model of Saethre-Chotzen syndrome" for peer review at eLife. Your article is being evaluated by three peer reviewers, and the evaluation has been overseen by a Reviewing Editor and Marianne Bronner as the Senior Editor. The reviewers have opted to remain anonymous. We have included the detailed reviews below. All three of the reviewers commend the basic finding that Twist1/Tcf12 is involved in synostosis, and that the zebrafish is therefore a useful model for studying this syndrome. However, at the same time there is a major concern about a lack of a mechanistic explanation for why Tcf12 leads to the defects you have observed. After discussing this with each of the reviewers, our general feeling is that for us to consider proceeding at eLife, there would need to be a more compelling mechanistic explanation for the observed effects. Based on these serious concerns, I would like to inquire as to whether you have additional mechanistic data that you think would address this. This manuscript from Teng et al. describes the effect of loss of Twist1 and Tcf12 on cranial bone growth and progenitor proliferation in the zebrafish and mouse models. It has been known for some time that heterozygous mutations in Twist1 result in coronal synostosis in Saethre-Chotzen syndrome in humans and mice, and more recently, has been demonstrated that Tcf12 is a Twist1 binding partner that is also involved in coronal synostosis in humans and mice. 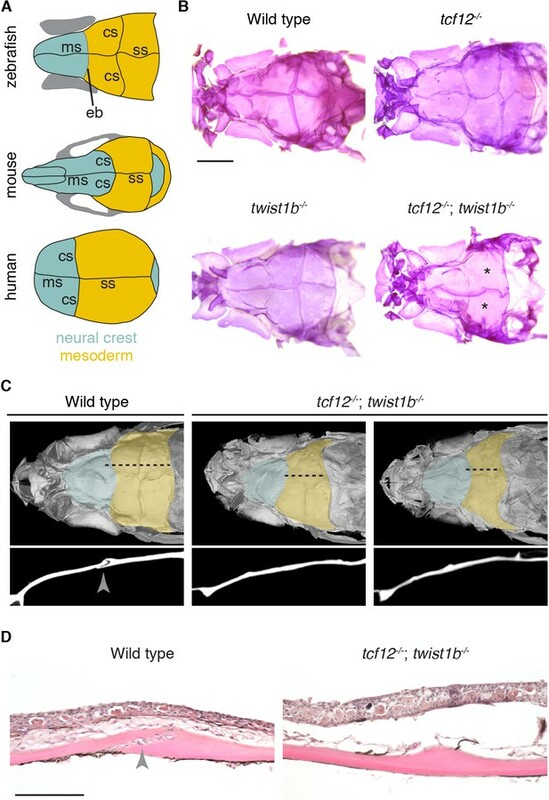 Here, the authors demonstrate that as in mice, Twist1 and Tcf12 interact in zebrafish such that tcf12-/-; twist1b-/- exhibit coronal synostosis. Using successive bone staining in zebrafish the authors characterize bone growth in these mutants and find that though bone growth is slightly elevated in the earliest phase of formation of the development of the calvarial bones, bone growth is diminished later; these changes correlate with the incidence of synostosis. The number of proliferative osteoprogenitors and osteoblasts is increased in zebrafish, but in mouse only osteoprogenitors have an increased proliferation, though the total number of osteoblasts increases. Finally the authors demonstrate that the craniosynostosis phenotype requires loss of Twist1 from both the parietal and frontal bone. Together, these careful analyses make a compelling case that Twist1 and Tcf12 control bone progenitor cell dynamics to regulate normal growth of the calvaria and prevent craniosynostosis. The zebrafish work suggests that there is nothing unique about the neural crest/mesoderm boundary, but rather suggests that there may be directionality in the way that Twist1/Tcf12 regulate bone growth, though this possibility is not explored and the question of why the coronal suture is specifically synostosed remains uncertain. Nevertheless, these findings advance our understanding of the developmental function of Twist1 and Tcf12 in craniosynostosis in zebrafish and mice and will be of broad interest to the craniofacial development and disease communities. Additionally, these studies validate the zebrafish as a powerful model system for the study of the developmental mechanisms underlying craniosynostosis. The manuscript 'Altered progenitor dynamics prefigure craniosynostosis in a zebrafish model of Saethre-Chotzen syndrome' by Teng et al. presents interesting new findings concerning animal models of coronal suture fusion from TWIST1 and TCF12 mutations in the zebrafish and the mouse. This paper is significant as it demonstrates conservation of mechanisms underlying coronal suture fusion and presentation of Twist1/Tcf12 phenotypes in the zebrafish. The authors show independence of these suture pathologies to embryological tissue origin, suggesting that the common/ancestral developmental specification of suture formation may have different causes. The authors highlight changes in growth of the calvaria parallel/presage adult pathologies suggesting that changes in growth rate and potential may underlie observed pathologies. To support these observations the authors detail changes in the number of proliferative cells in the osteogenic fronts suggesting the defect in rate maybe attributable to lack of maintenance of progenitors/stem cells. The implications of their findings are first and foremost the conservation of mechanisms of craniosynostosis between zebrafish and mouse. This matter has been of much debate in the field with little data to support either opinion. The discussion of the similarities between the models and the independence to embryological tissue of origin (mesoderm/neural crest) is well done and important for the presentation of this work to the field. Second, the developmental analysis clearly pointed to early growth events as being primary to the changes in suture phenotypes in the models. This is in stark contrast to the center of much of the work in the field centering on suture mesenchyme and late maintenance of patency. The causes of the early shifts in proliferative capacity may be diverse, but the change in growth may be a shared phenotype underlying suture pathologies associated with synostosis. 1) Of general concern is the lack of sufficient experimental evidence to support conclusions of changes in postnatal stem cells as key finding of their mechanism. The authors look to BrdU and Sp7 expression to argue for changes in progenitor populations and proliferative potential. This measure is nicely tied to changes in osteogenic progression (surface). This is a measure of proliferation and not stem cells per se; the decrease in numbers could be in fact due to altered production of mitogens such as Fgf signaling factors that have been associated with altered suture fusion. Notably, Twist function is tied to Fgfr2. Further, without label retention studies, lineage tracing, or use of different progenitor markers such as gli1 and prrx1, it is not appropriate to conclude that this is due to altered maintenance of postembryonic stem cell populations. There is little evidence for the effect being due to alteration in stem cells and supporting their discussion of this as the mechanism for the differential growth rate. As one of the strengths of this work is the commonalities between mouse and zebrafish providing dual models to approach mechanism, it is imperative that more of the mechanisms be ironed out, lest the impact of the findings here highlighted above will be lessened. 2) The detailing of the growth dynamics as an early causative mechanism for how suture defects arise is interesting and potentially transformative for the field. However, the descriptions presented in this manuscript are quite descriptive and do not attempt to integrate how expression of key CS associated gene such as Fgfs are varied in their mutants, nor how alteration in Twist1/Tcf12 may affect their expression. Cranial sutures are thought to contain stem cells and this proposal has driven a lot of recent research into craniosynostosis. The suggestion that embryonic and postnatal stem cell populations are distinct is intriguing. This study is limited to closure of the coronal suture in a specific model for craniosynostosis. Although the coronal suture is the suture that is most frequently closed prematurely, other sutures, especially of the facial skeleton have been shown to close prematurely in humans with craniosynostosis syndromes and in Fgfr-related mouse models for craniosynostosis. Have the authors looked carefully at other sutures, facial or vault? Would they expect/not expect suture closure in other sutures? Is the proposal of stem cell mechanism specific to the coronal suture? To cranial vault sutures? Or would you expect to see them in facial sutures too? Why or why not? The fact that you report other skull bone abnormalities local to the vault sutures makes me wonder if we have the whole story here. To focus only on the coronal suture limits the impact of these findings and makes it unclear why the coronal suture is targeted (given there is no mesoderm-nc boundary at this suture in fish). The live imaging of the sutures is a great tool providing important information. The result that Tcf12 and Twist1 have a "conserved" early function during skull bone growth to regulate the balance of progenitors and osteoblasts – is only demonstrated for fish here, but it is a beginning to show conservation across vertebrates. The Discussion is overly long and does not provide a solid explanation of what was observed. If there truly are no other fusions in the skulls of these fish, why does the coronal suture respond specifically to these mutations? Thank you for resubmitting your work entitled "Altered progenitor dynamics prefigure craniosynostosis in a zebrafish model of Saethre-Chotzen syndrome" for further consideration at eLife. Your revised article has been favorably evaluated by Marianne Bronner as the Senior Editor, a Reviewing Editor, and the 3 original reviewers. a) "It is hard to see what the metrics of their quantitation are as I cannot see how "area" of expression can be garnered from those sections – especially when there are 4-6 foci within a section to demarcate regions. Statements of new markers for suture progenitors seems a bit overstated as the expression is generally across the bones – showing lack of expression in non-suture locations, or whole mounts might be more convincing. " b) "I found it very hard to see the orange and magenta lines in Figure 7A and once I blew it up big enough to be able to see it, I was unconvinced by the description offered in the figure legend. According to the authors, prxx1a is broadly expressed at the bone fronts and in the sutures and perisosteum at 10mm and in the sutures and periosteum at adult stages. I felt more data, or better figures were required to support their overall conclusion that their findings indicate a selective exhaustion of osteoprogenitors at the developing coronal suture – as opposed to more generally across skull bones. " c) "I still don't prefer this sentence, beginning: "As in mice and humans, coronal suture loss correlated with reduced anterior-posterior growth of the frontal and parietal bones, resulting in asymmetrically shaped heads when the suture was lost unilaterally." As written, the authors still ascribe causality of head asymmetry to suture loss, whereas both head asymmetry and unilateral suture loss may be consequences of asymmetrically reduced growth. " 1) Provide more convincing quantification to ascribe this to progenitor loss. 2) If you feel that this cannot be done, then a rewording of the title and discuss to indicate that the study centers on the role of Twist1/Tcf12 in a zebrafish model of CS, and then discuss the possibility that this could be due to progenitor loss although not proven. 1) Of general concern is the lack of sufficient experimental evidence to support conclusions of changes in postnatal stem cells as key finding of their mechanism. The authors look to BrdU and Sp7 expression to argue for changes in progenitor populations and proliferative potential. This measure is nicely tied to changes in osteogenic progression (surface). This is a measure of proliferation and not stem cells per se; the decrease in numbers could be in fact be due to altered production of mitogens such as Fgf signaling factors that have been associated with altered suture fusion. Notably, Twist function is tied to Fgfr2. Further, without label retention studies, lineage tracing, or use of different progenitor markers such as gli1 and prrx1, it is not appropriate to conclude that this is due to altered maintenance of postembryonic stem cell populations. There is little evidence for the effect being due to alteration in stem cells and supporting their discussion of this as the mechanism for the differential growth rate. We agree that our original experiments had only inferred stem cell populations in the mutant calvarial bones and sutures through analysis of proliferation and osteoblast production. In a new Figure 7, we now directly examine progenitor populations in zebrafish using three markers (gli1, grem1a, prrx1a), both at a stage when the calvarial bones are still growing and at a later stage when the sutures have formed. Consistent with our original model, we find that suture progenitor cells marked by these genes are reduced in number at the developing coronal but not the sagittal suture. We also now show a similar depletion of Gli1+ and Grem1+ progenitors at the mouse coronal but not the sagittal suture at embryonic stages. As described in a new Results subsection (“Selective reduction of the osteoprogenitor pool at the mutant coronal suture”), these new experiments show molecular homology between zebrafish and mouse sutural stem cells, reveal Grem1 as a potential new sutural stem cell marker in both species, and confirm selective exhaustion of osteoprogenitors at the coronal versus the sagittal suture. In a new Figure 7—figure supplement 1, we identify expression of Fgfr2 and the Fgf target gene dusp6 at the developing coronal suture of zebrafish. In mutants, we find that the domain of osteoprogenitors expressing fgfr2 and dusp6 is reduced, yet the remaining bone front cells express similar levels of both genes. The result that Tcfl2 and Twist1 have a "conserved" early function during skull bone growth to regulate the balance of progenitors and osteoblasts – is only demonstrated for fish here, but it is a beginning to show conservation across vertebrates. We have developed a zebrafish model for a particular form of craniosynostosis, Saethre-Chotzen Syndrome, which almost exclusively affects the coronal suture in mice and humans. A significant and unexpected finding from our study is that the coronal suture is likewise most sensitive to loss of Twist1 and Tcf12, despite this forming at a mesoderm-mesoderm boundary in fish and a neural crest-mesoderm boundary in mammals. While we have not detected loss of other sutures in our fish mutants, we do observe occasional ectopic sutures and other skull anomalies in different mutant combinations, which we describe in detail in Figure 1—figure supplement 3. In response to Reviewer #2(see new Figure 7), we have also examined several progenitor markers (prrx1a, grem1a, gli1) in mutant fish and mice, which reveal selective exhaustion of parietal and frontal bone progenitor pools. We also now show altered directional growth of the parietal and frontal bones in mutants, which brings these bones together earlier than normal at the prospective coronal suture zone. Accordingly, we have extensively revised the Discussion to incorporate these new findings and their implications while condensing other sections to make it more focused. We agree that quantification was difficult in zebrafish mutants given the small numbers of cells and low RNA signal. We have therefore removed the quantification from Figure 7, as well as the accompanying statement claiming loss of progenitors at the developing coronal suture of zebrafish. We now provide magnified images in Figure 7A to better visualize the developing coronal sutures in zebrafish. We also added arrows showing the periosteal expression of prrx1a but not grem1a and gli1 within the periosteum, and arrows showing suture expression. As stated below, we no longer claim exhaustion of osteoprogenitors in zebrafish at the 10 mm stage, instead only referring to the more convincing mouse data in Figure 7C. We agree that “resulting in” still implied causality. We therefore changed the sentence to better reflect our findings and avoid claims of causality: “…in cases where the suture was lost unilaterally we consistently observed reduced anterior-posterior growth of that side of the skull”. We agree that the quantification of the progenitor loss in zebrafish sutures was difficult due to the small numbers of cells and low level of expression of the genes examined. This made it hard to conclusively count “progenitors”, especially in mutants where the bones are abnormally shaped and more closely apposed. We have therefore chosen option (2) and revised the title and Discussion accordingly. The title is changed from “Altered progenitor dynamics prefigure…” to “Altered bone growth dynamics prefigure craniosynostosis in a zebrafish model of Saethre-Chotzen syndrome”. We feel that this better reflects our in vivo imaging data in zebrafish revealing that the extent of altered bone growth predicts which mutants will develop coronal suture defects. The title also reflects our conceptual advance of developing the first genetic model of CS in zebrafish. When referring to reduced progenitors at the mutant coronal suture, we now only refer to the mouse data in Figure 7C which we feel is convincing – the reviewers only expressed concern with the zebrafish data in Figure 7A. For example, in the Discussion: “These findings … suggest, at least in mice, a selective exhaustion of osteoprogenitors at the developing coronal suture”. We have also added new language that Gli1, Grem1, and Prrx1 label “putative” progenitors in the developing sutures, given that lineage tracing studies at these stages would still be needed to confirm this. We thank Megan Matsutani and Jennifer DeKoeyer Crump for fish care; Seth Ruffins, Director of the Microscopy Core Facility of USC Stem Cell, for assistance in rendering micro-CT reconstructions; and members of the Maxson, Crump, and Yang Chai labs for insightful discussions. This work was supported by NIH grant R01DE026339 to REM and JGC, NIH grant R35DE027550 to JGC, NIH training fellowships F31DE024031 and T90DE021982 to CST, and the Helen Hay Whitney Postdoctoral fellowship to DTF. Animal experimentation: This study was performed in strict accordance with the recommendations in the Guide for the Care and Use of Laboratory Animals of the National Institutes of Health. The University of Southern California Institutional Animal Care and Use Committee (IACUC) approved all animal experiments (protocol #20552), and all methods were performed in accordance with the relevant guidelines and regulations. © 2018, Teng et al.